Fire damage at this Stockton home left behind a lot of soot and smoke damage along with the foul odor associated with house fires. 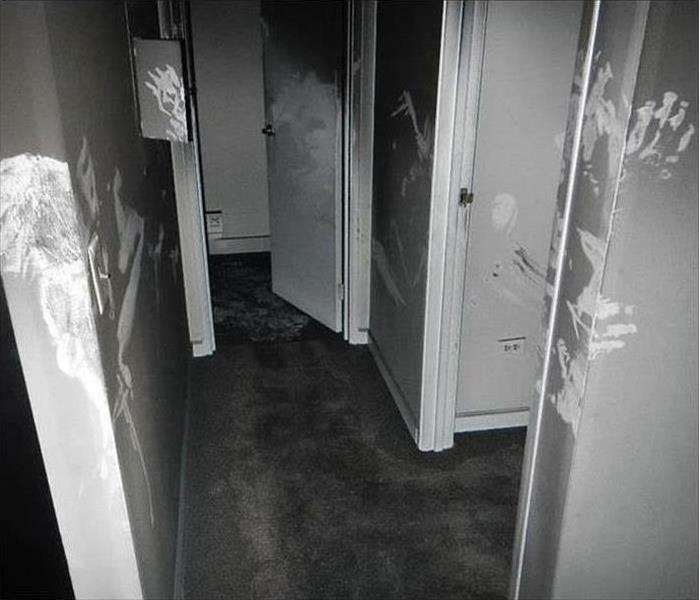 The photo displays the soot and smoke residue that was left on most surfaces in the home. 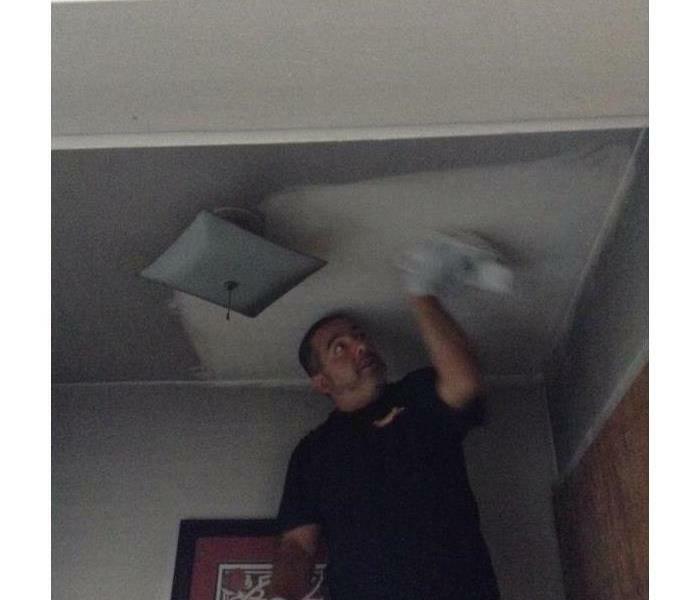 SERVPRO of Stockton is often chosen to clean up the fire damage along with cleaning the smoke damage and dealing with the odor. Water spillage, when not removed quickly, can result in seepage into the tongue and groove joints of floorboards. This can become more problematic in crawlspace foundation homes in Ortega to remove all the moisture. SERVPRO has talented and skilled technicians that utilize industry-leading methods and devices to ensure success. Here a small improvised tent is suctioning out the residual moisture, salvaging the flooring. 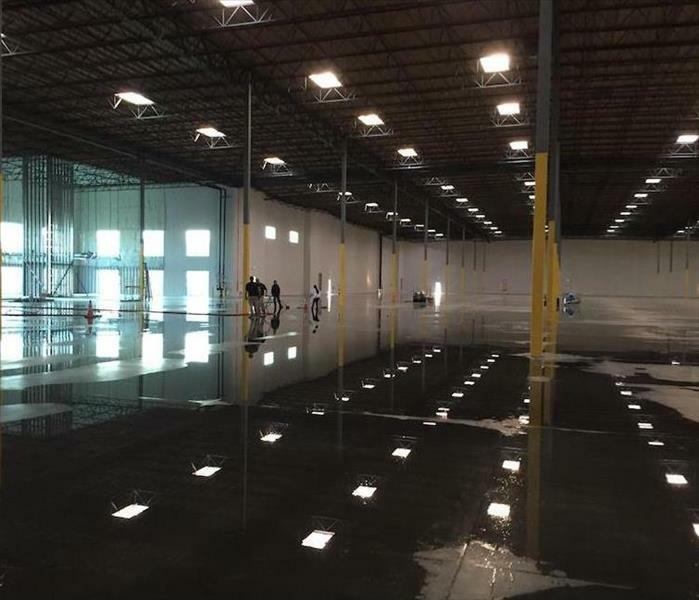 SERVPRO of Stockton was recently called to remediate a flooded warehouse in Manteca, CA. The damage was on a large scale with total water extraction area being about 47,000 SF. Should your warehouse or commercial plant have a similar problem, don't hesitate to call our team at (209) 477-3090. SERVPRO of Stockton held its annual strategy meeting at FrsTEAMS' corporate headquarters' new conference room in Hayward, California. Roy Drake, CEO of Cleanair Image Inc, dba SERVPRO of Stockton and his management team met to discuss business strategies for 2019. Thank you to FrsTEAM for their generosity in making their facility available to our team. 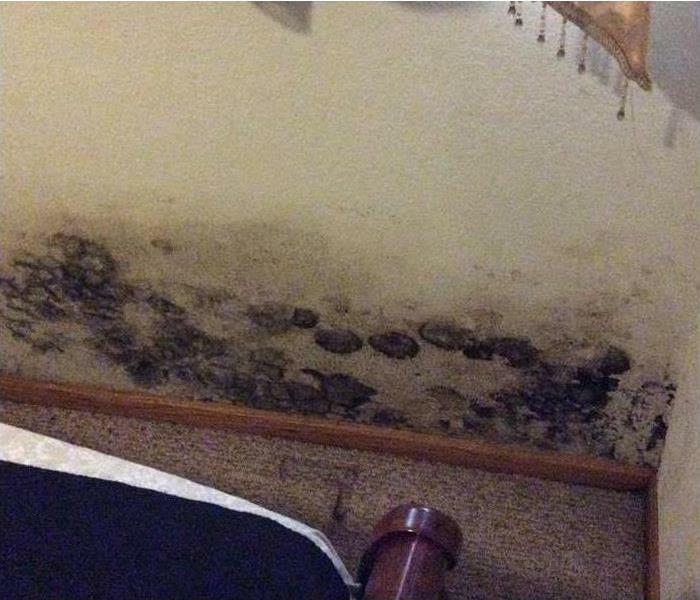 The visible signs of mold damage go deeper than the surface staining shown in this Stockton bedroom. 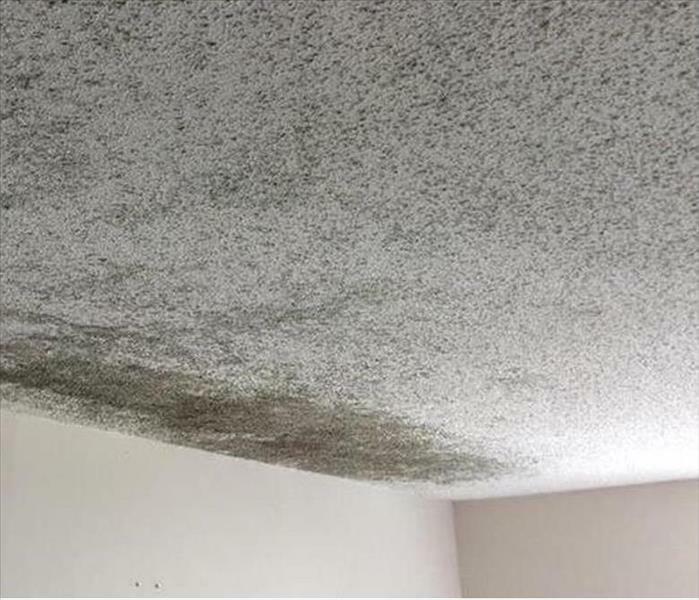 Mold remediation by our SERVPRO techs require the tear-out of the damaged drywall, lifting and inspecting the carpet and baseboard for microbial growth, and then applying an antifungal agent to protect against future infestations. We do it right, just a phone call away. Some fires require the removal of non-salvageable walls, ceilings, trim, and flooring materials. 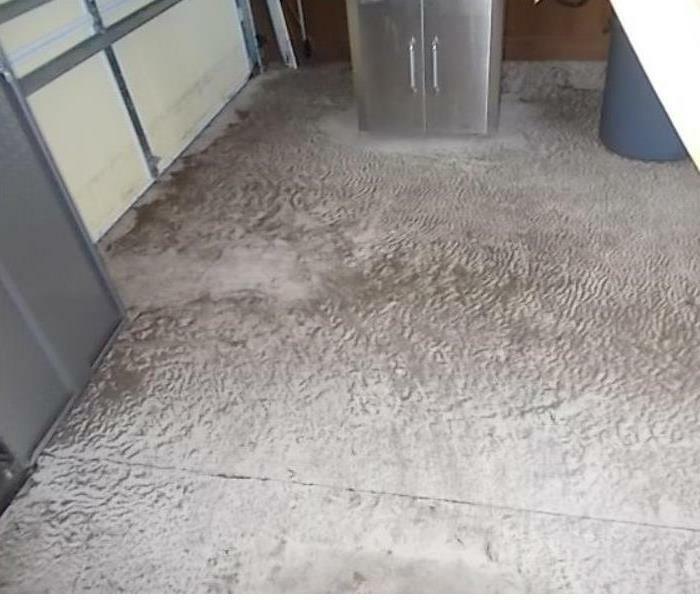 If an Ortega property needs a cleanup, soot wipe down, and full-fledged deodorizing service using a thermal fogger, then SERVPRO is the obvious choice. 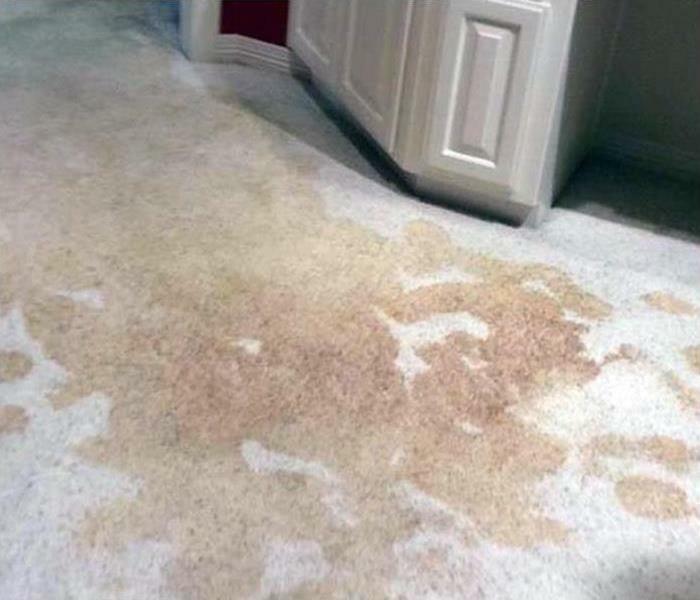 When water damages your carpet, you need a team of professionals like the trained and certified experts at SERVPRO. We are leaders in the restoration industry, and we will respond quickly to all water damage emergencies. SERVPRO of Stockton has the water damage experience and equipment needed to restore your carpet to pre-damage condition. 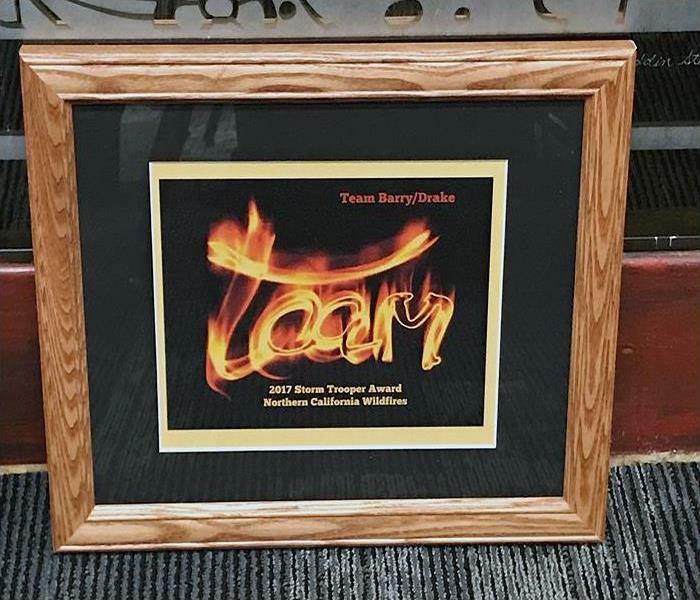 The team at SERVPRO of Stockton recently received recognition for participating in fire storm cleanup in Northern California. We are pleased to be recognized for all of our hard work helping those in need. We were able to assist in the cleanup thanks to our 24-hour emergency service. Our technicians were able to arrive quickly and immediately begin cleaning up and starting the restoration process. Our disaster recovery team is available 24/7 and can handle any size disaster. The dampness from a leak caused this mold staining to occur in this Ortega home. Popcorn-surfaced ceilings required careful SERVPRO technician wipe down with proprietary cleaning agents to remove the mold patches without any controlled demolition. 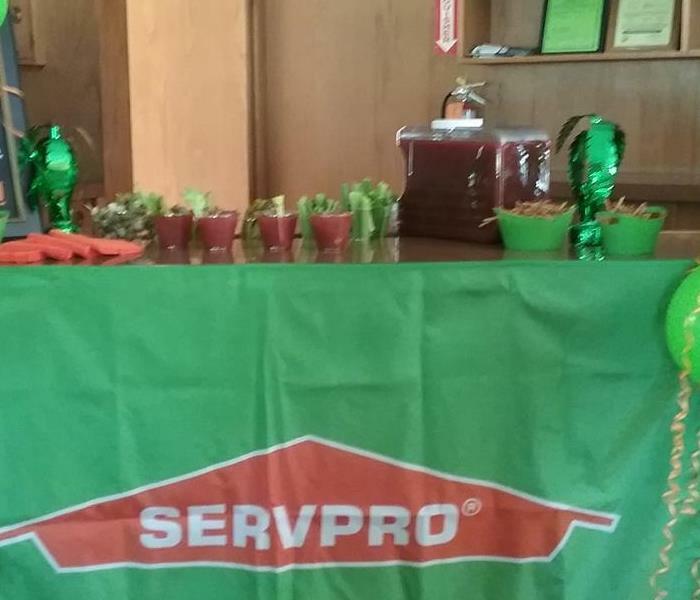 The expert cleaning technicians from SERVPRO of Stockton are working in Santa Rosa, California to filter and clean the indoor air at a senior living facility. The Maintenance department for this senior community called our company as soon as nearby forest fires began to affect the indoor air quality. We were able to strategically install HEPA air filtration units throughout the buildings. It is a pleasure to work for ethical clients who do everything in their power to protect their residents. 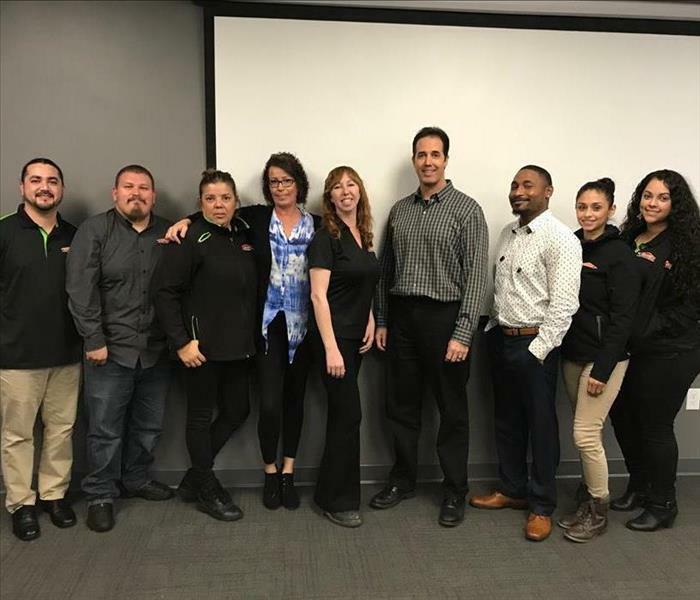 SERVPRO of Stockton Branch Manager, Tammy Jensen meets with her key management and lead production team to prepare for fire storm cleanup duties in Northern California. It requires planning to be able to mount an effective response to cleanup and deodorize smoke contaminated properties. 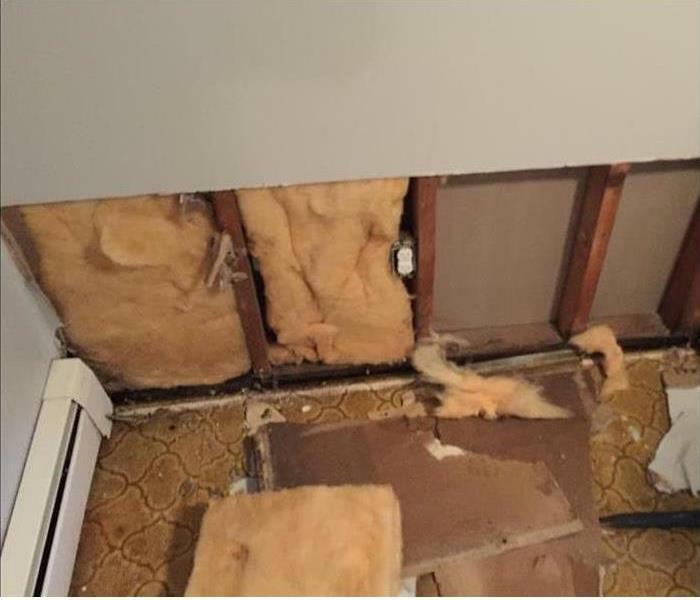 A water leak soaked this corner of a room in Stockton and damaged the drywall. The practical service was demolition and discarding the non-salvageable drywall panels. The batten insulation was dried and reinstalled along with new wall material after we sprayed an antimicrobial agent into the cavity. 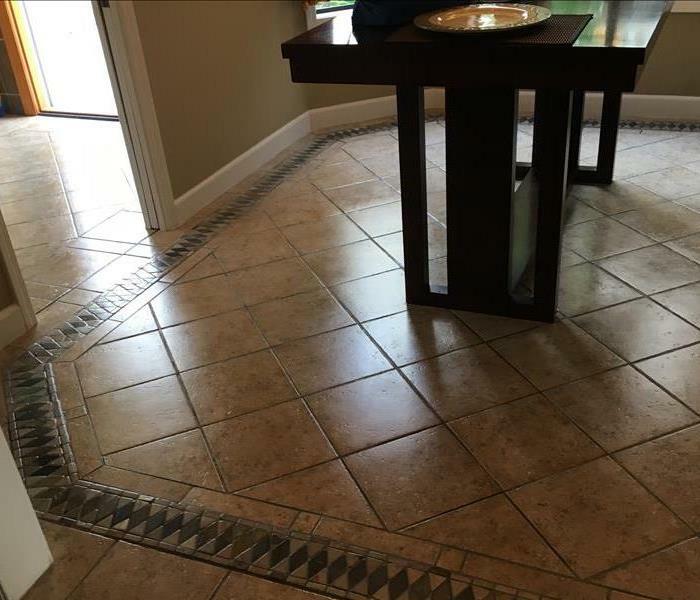 Count on SERVPRO to do it right! SERVPRO of Stockton certified technicians are trained in safe cleanup procedures for servicing mold, microbial contamination and bacteria cleanup. Suiting up in "Tyvek" is just one of the precautions that our employees take when working on these potentially hazardous types of projects. In each of the last several years, SERVPRO of Stockton has helped foothill residents with fire cleanup in the foothills. 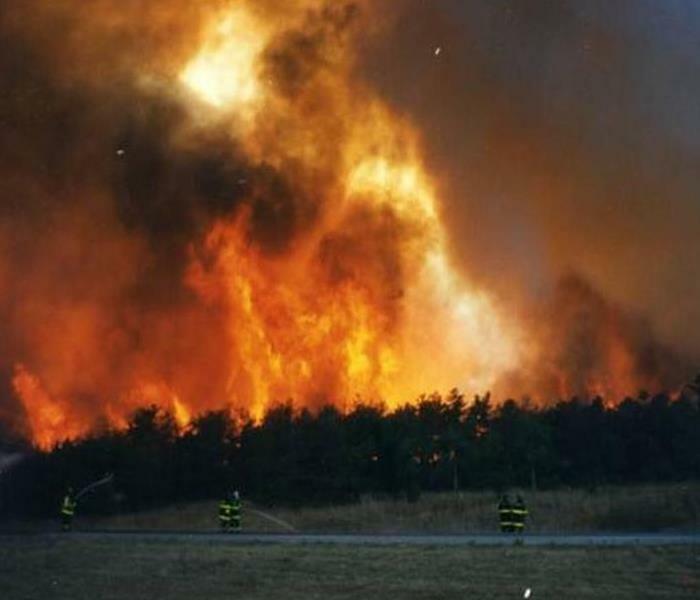 This year could be another fire storm year. 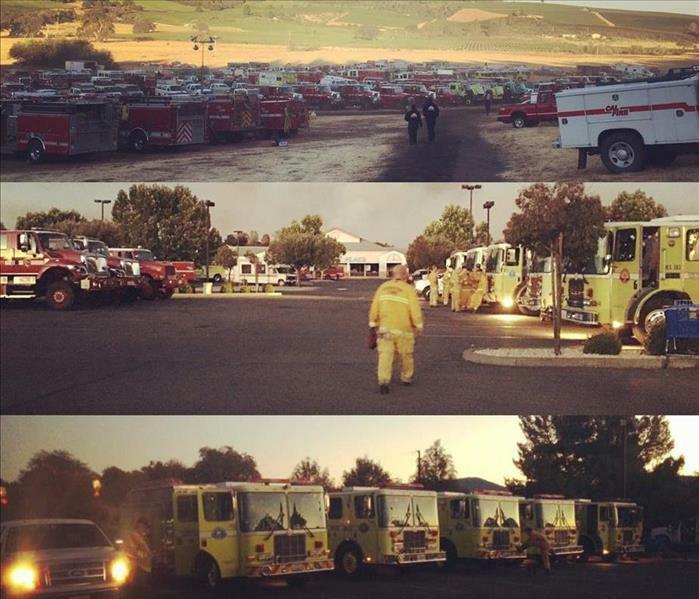 We are ready to provide fire and smoke cleanup. What is interesting about being from California and then traveling to other parts of the country, is to see the damage caused by natural events and storms that we seldom experience in the Golden State. We all see news reports about Oklahoma and Texas being pounded by golfball size hail. 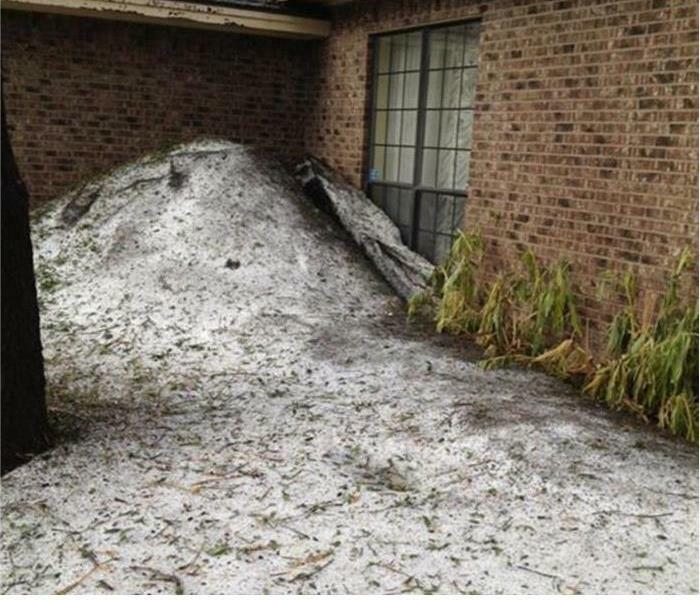 We can't imagine that hail can pile up like a "snow bank" or that it can be so heavy that it will take hours to melt. When we travel to other regions of the country on storm team duty we meet a lot of interesting people and gain an appreciation for the weather challenges they face. After a few months in our new SERVPRO of Stockton Office we were able to install a steel, powder coated sign emblazoned with the orange SERVPRO house logo. Add a green stripe on the wall... nice touch. Being based in California, we are accustomed to drying wet structures. When a special team of restoration employees took part in storm cleanup in Kentucky they were surprised to see "indoor ice rinks" (frozen water) on the floors of the homes they had been dispatched to. They called it "hard water cleanup." 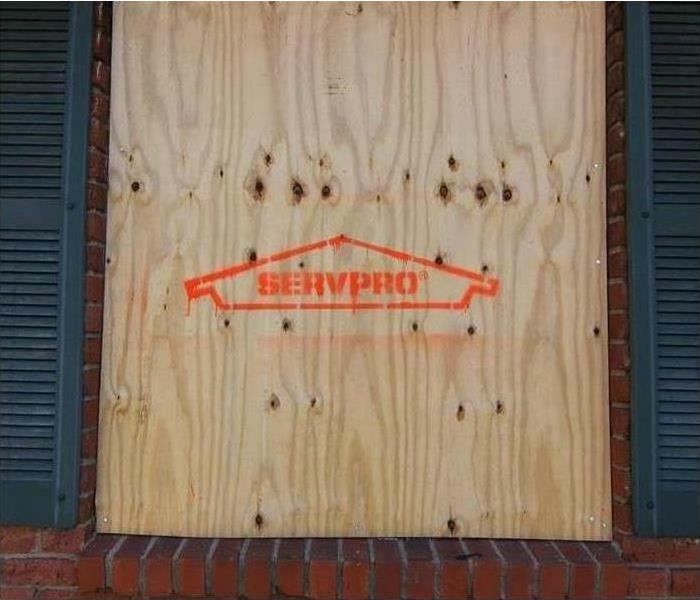 When a window or door requires emergency board up services you can count on SERVPRO of Stockton to be available. 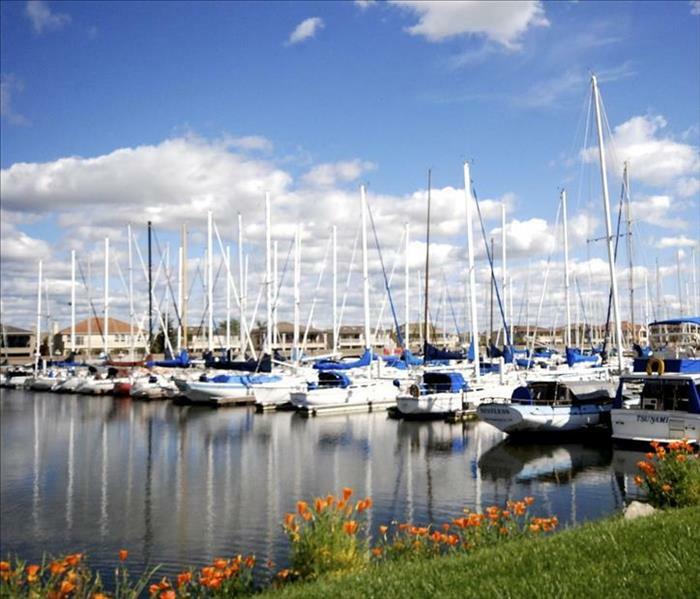 In the city of Stockton we are able to provide paint coatings to the board-up when required by city code. Thermal imagery detects temperature difference in the area it is pointed at. If a military person aims the thermal image camera into a dark field, it would detect the heat signature of any person who may be in range. In the restoration industry a thermal image camera can be used to find different heat signatures within a building structure. For example when portions of structural materials get wet they will have their own heat signature. 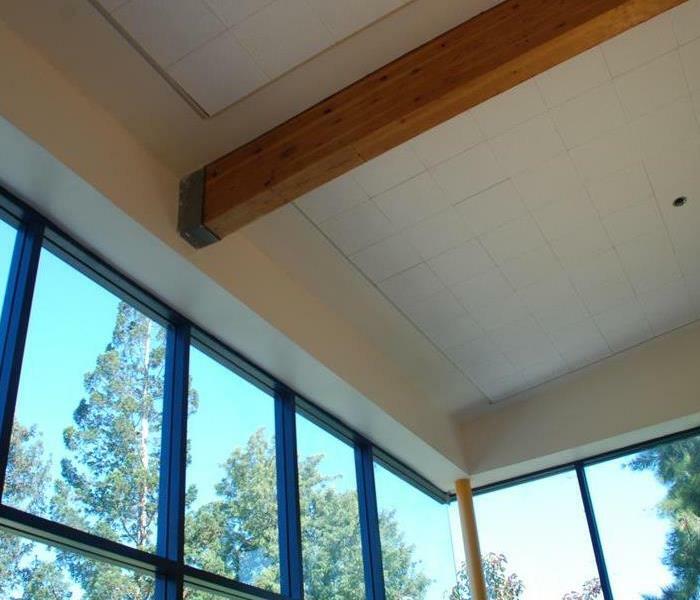 This is a convenient way to find hidden moisture in ceilings and upper portions of walls. It saves the technician from having to climb a ladder to put a hand held moisture meter on the ceiling or wall. 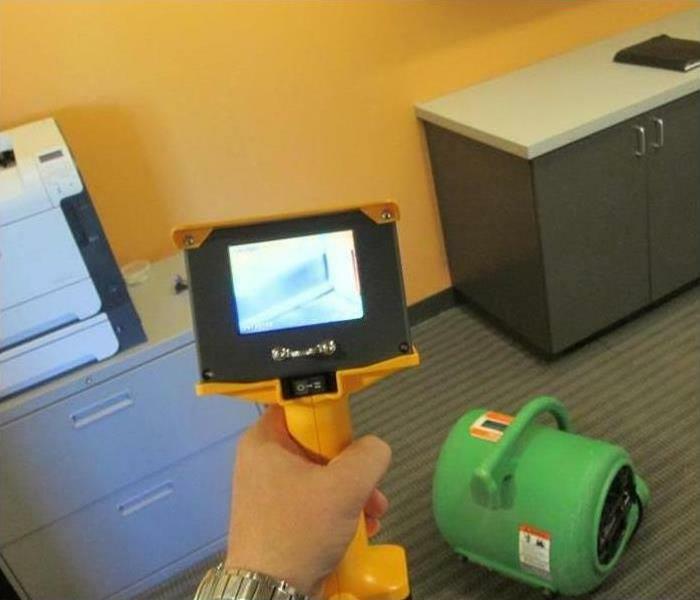 Even when used in easy to access locations, a thermal image camera saves time. A small drainage culvert reached overflow stage and spilled water into an office complex. The water came into this building under double glass doorways. 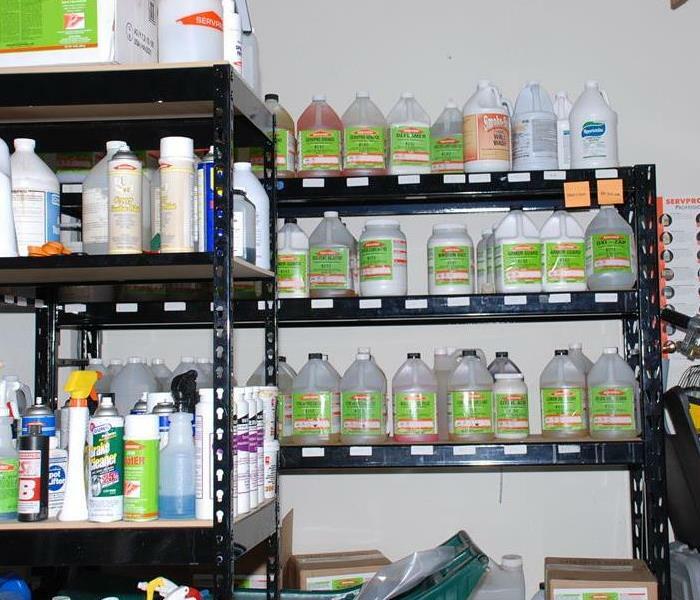 The water contained chemical fertilizers and other contaminants and most be removed and hard surfaces will be sanitized. We are expert in this service. SERVPRO of Stockton is a sponsor of the MGCC annual golf tournament. We are pleased to support social services and organization that make life better for the residents of our community. 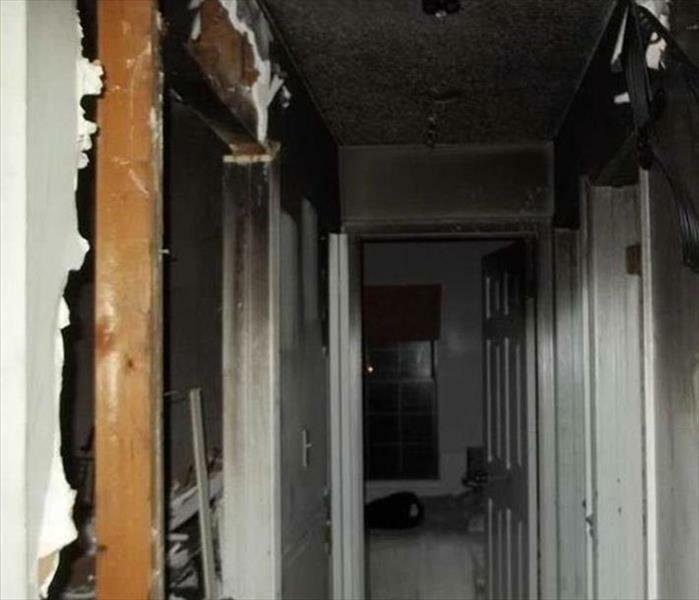 Fires in apartment buildings often spread to more than one unit. 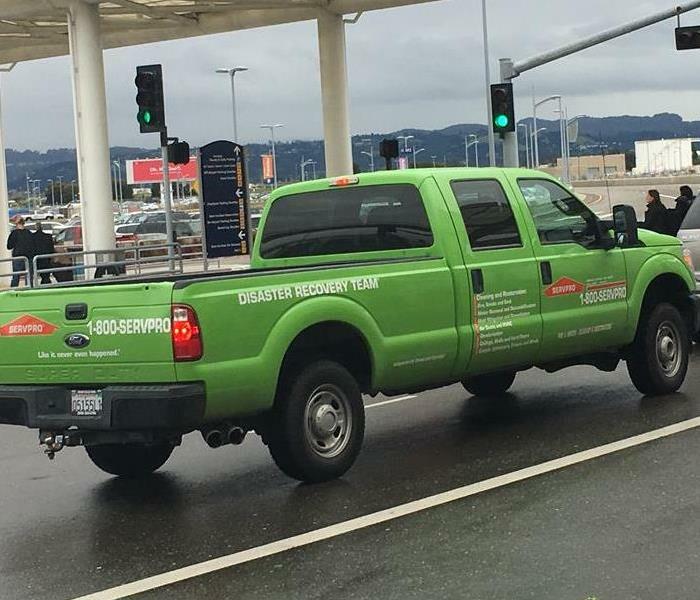 Our SERVPRO of Stockton crew has been in the San Francisco Bay Area helping our sister franchise in San Francisco clean up an apartment fire scene. Using a thermal fogger is an effective way to deodorize because it caused de-odorizing chemicals to be able to penetrate into the tiniest seams, cracks and gaps in a structure. Its reaches the tiny areas where odors linger. No classroom time was lost because SERVPRO was able to remove the mold, sand and stain this beam over the weekend. This beam and three others were made to look as good as new in two days. Kitchen fires can produce smoke and soot that contains grease and may be very difficult to remove. Wrong methods will often set the soot and make stains. 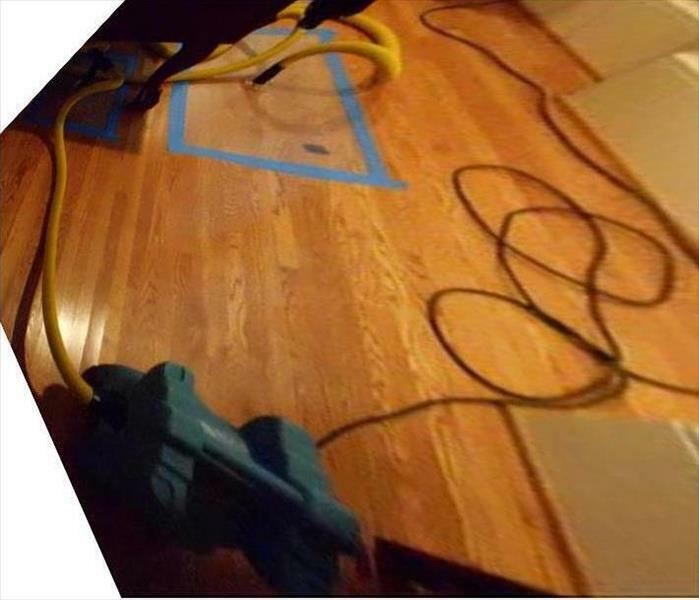 SERVPRO technicians are trained to do the job correctly. 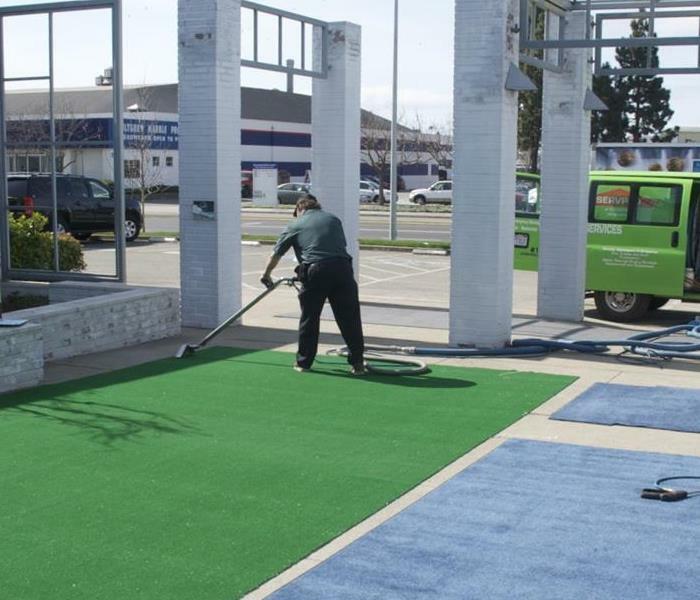 The technicians at SERVPRO of Stockton provide cleanup services for a major automobile brand. 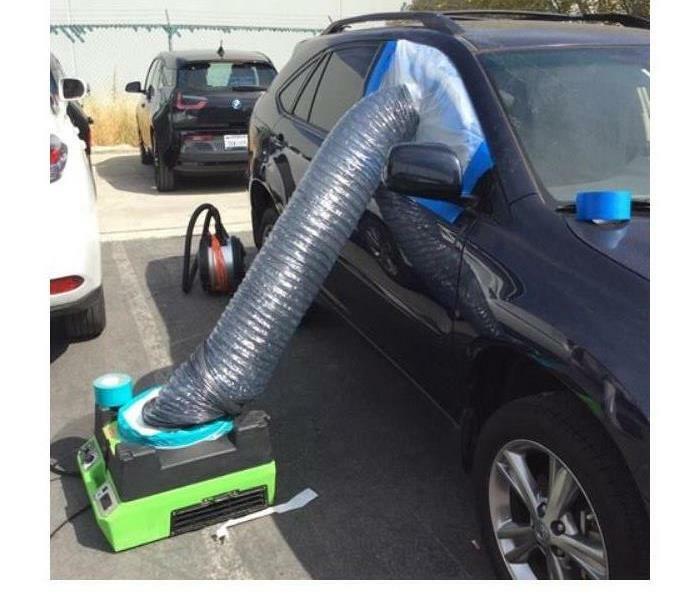 We travel around Northern California to dealerships and service centers to perform drying, deodorizing, mold removal and other services for new car interiors. Removing gypsum board (sheetrock) in a controlled fashion makes it easier for our restoration crew to replace the new material after a structure has been dried. 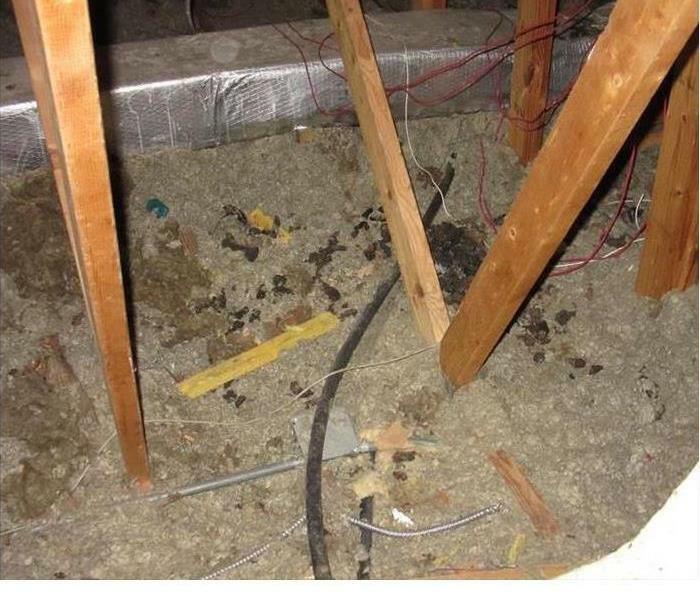 Water can certainly cause a lot of damage when it flows through a structure. The past year of El Nino rain has caused grass and tree growth in The foothills close to Stockton. SERVPRO of Stockton is ready to help with potential fires and the smoke and soot damage fallout that often takes place. Let's hope we don't have an up tick in fire this year, but if we do , we are here to help. Bed Bugs... what a pest. 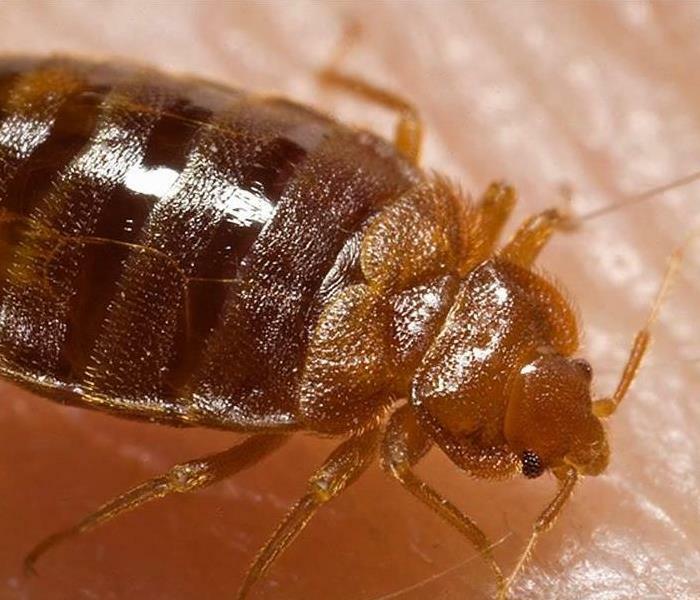 Bed bugs are a nasty pest that affect all kinds of properties from residential to commercial. While we are not licensed to kill them we can certainly take part in the post cleanup. The SERVPRO storm team is on the move once again. National team members are on their way to tornadoes and flooding in Texas and Oklahoma. 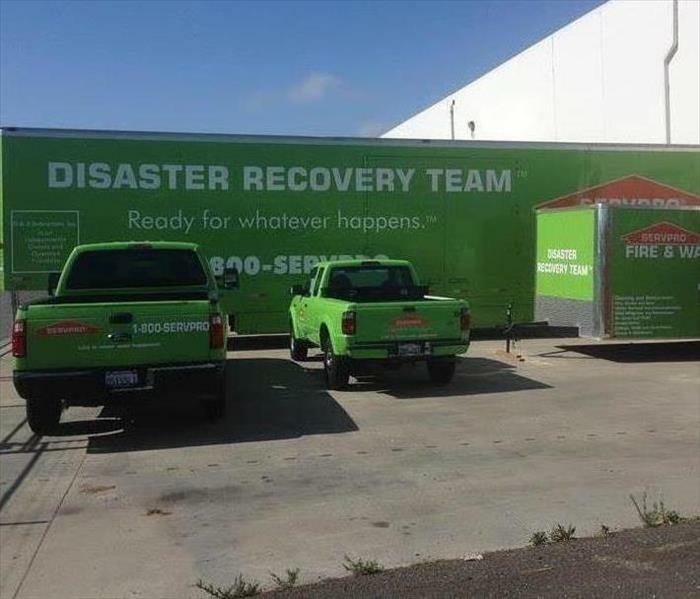 SERVPRO of Stockton storm team trained technicians have worked all across the country in the past several years. 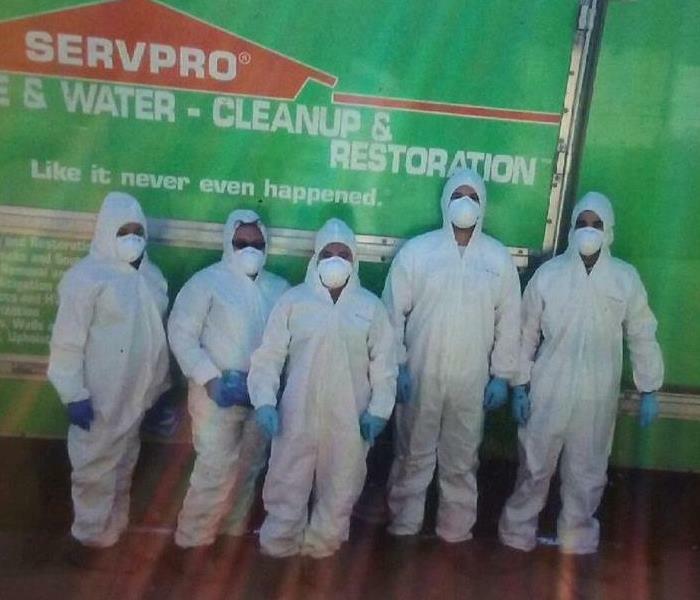 When a commercial or residential structure suffers damages from fire, water or even mold, SERVPRO of Stockton often packs out from the stucture and then cleans them. 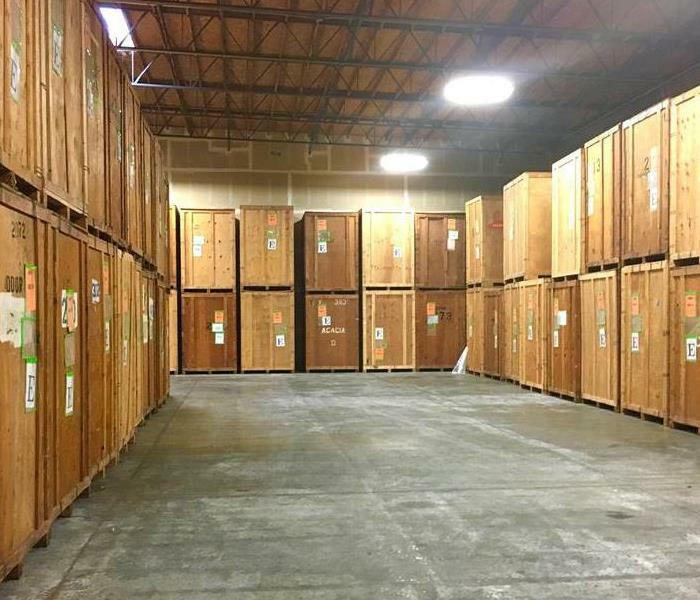 Once clean, the contents are safely stored in vaults in our climate controlled warehouse here in Stockton until the damaged / contaminated structure is made ready for their return. Ozone gas in nature serves as an air cleaning system. It attacks an oxygen molecule and causes new oxygen molecules to form (this is oxidation). This action "scrubs" the air and makes it "fresh and clean". Ozone machine play a positive role in fire and smoke cleanup. 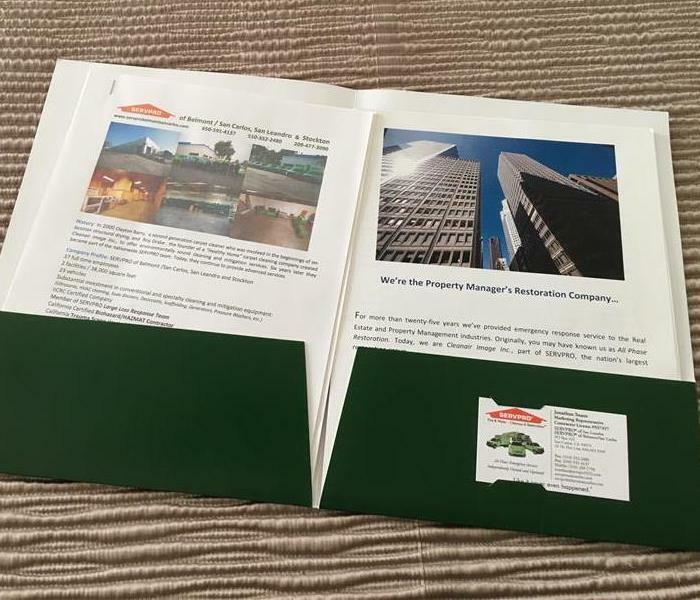 Introducing our new presentation folder and specialized brochures for commercial customers. 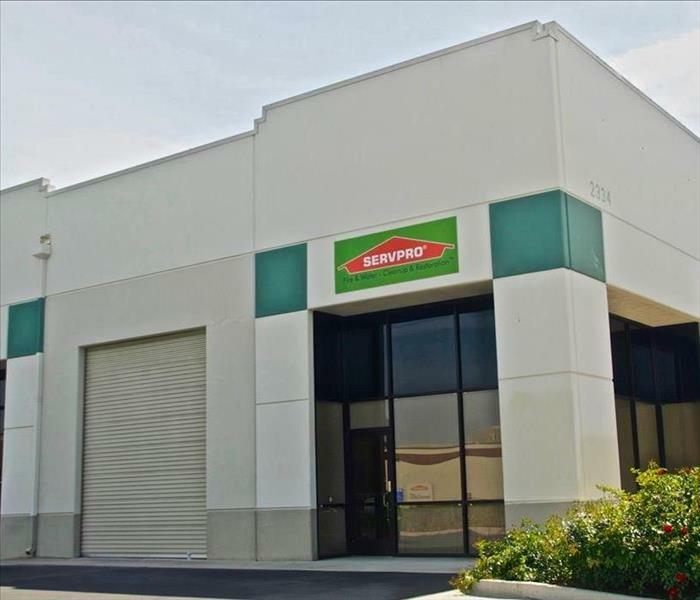 SERVPRO of Stockton specializes in serving commercial clients such as property management companies, realtors, retail business, food processing plants and a variety of manufacturing facilities. 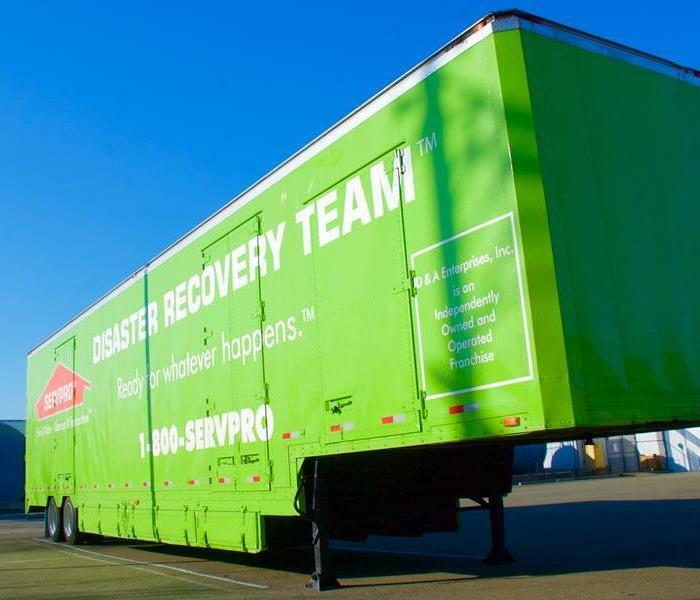 Perhaps you have seen SERVPRO box trucks traveling down the road? This photograph shows how we set up the interior of the box to transport water drying equipment to a water damaged location. SERVPRO Industries manufactures, packages and labels cleaning products for their 1,700 franchises. The products are designed to work on cleaning up smoke and soot, skunk odor, grease, even graffiti. Each local franchise is trained in the proper use of these products. Setting up a decon-chamber on location for mold cleanup. These plastic barriers isolate "clean" areas from contaminated areas. They also offer a measure of safety by keeping people away from the damaged portion of a room. 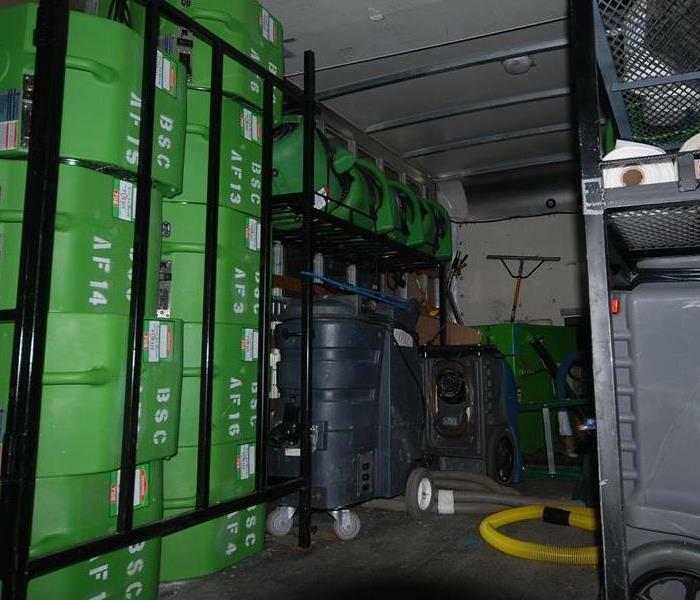 Our big green trailers are loaded and ready to roll to any large property disasters, local or distant. We keep drying equipment, cleaning supplies and a variety of tools in these trailers. We maintain an inhouse repair shop, located in a corner of our cleaning facility. Our Facilities and Fleet Manager, Robert Marshall maintains and repairs our drying equipment, our building and our fleet of more than twenty vehicles. 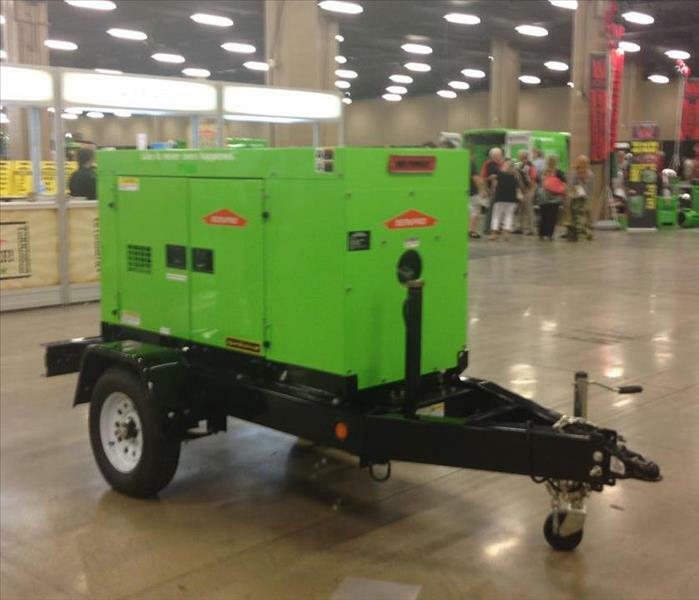 This is an ideal sized generator to have for emergency response work. We are able to arrive quickly at a damaged building and get emergency services underway. We use this generator to provide electricity for lighting and the use of power tools, until a larger generator can be installed. 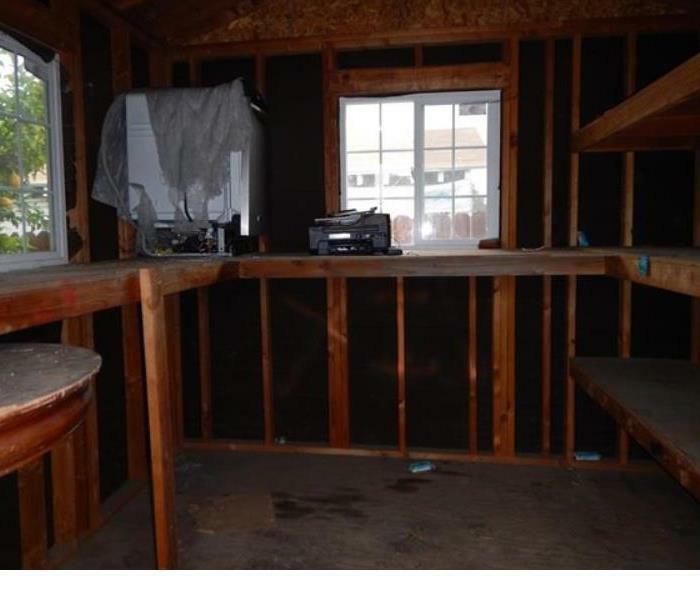 Serious water and mold damage can cause serious damage and in this case it resulted in having to install a new kitchen. Water from above warped the original set of cabinets and counter tops. The home owner was pleased with he updated replacement. 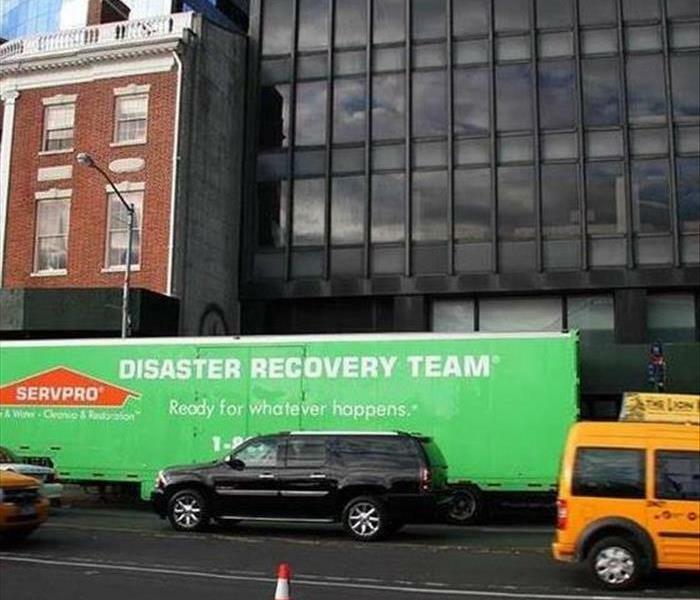 Serving as part of a storm team that dried a commercial building (printing company)) near Washington, D.C. We travel with other SERVPRO franchises to storm events all across the country. Soot removal and dust removal at the US Hornet Aircraft Carrier located in Alameda, California. 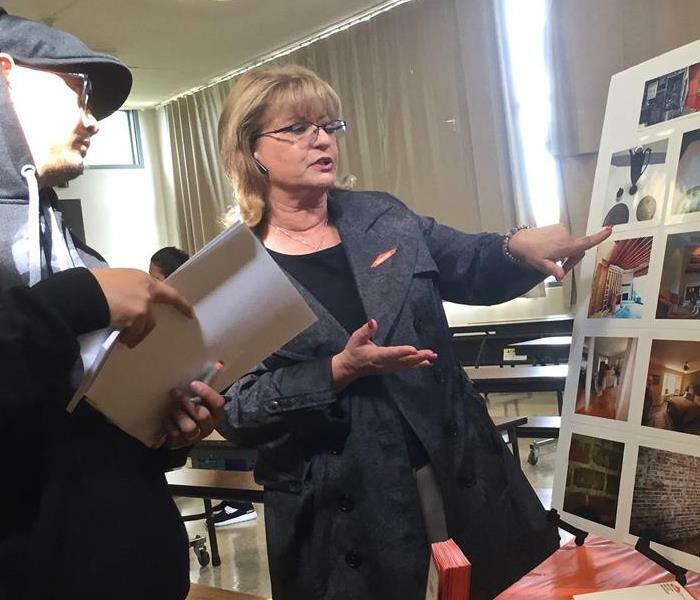 Pictured is Tammy Jensen, Manager of SERVPRO of Stockton. HEPA vacuums and even an old fashioned feather duster were used to clean the museum display. 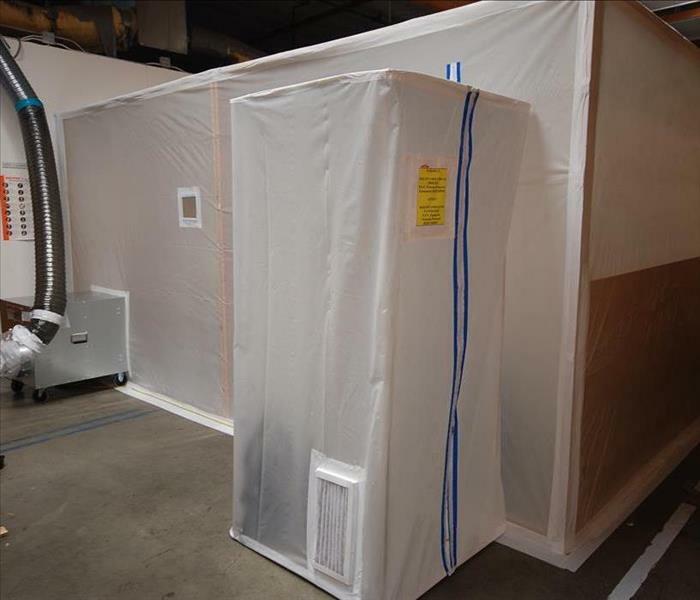 This is a "decon chamber" that we set up for a client with a mold contaminated warehouse. The "air lock" with blue zipper door is designed for technicians to enter and exit the work space without spreading contamination. Removing water stains from mattress fabric. 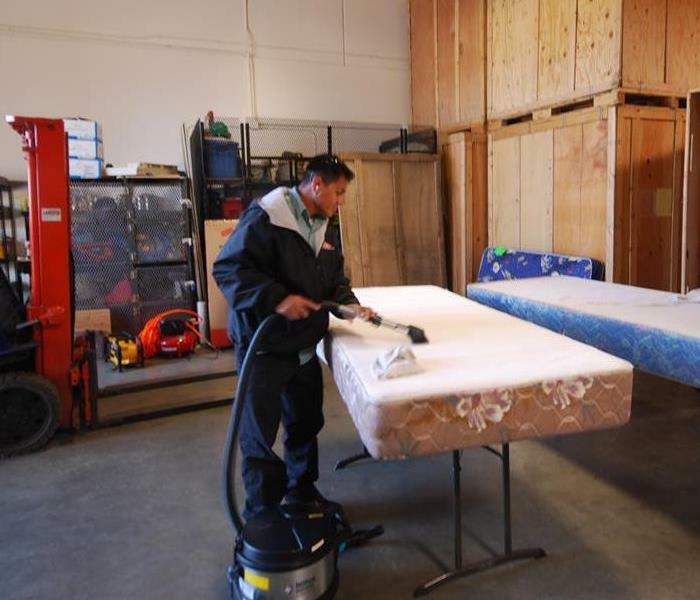 Water damage from a fire sprinkler system leak caused water rings (stains) on this mattress (and other textiles) which are being removed by a skilled SERVPRO technician at our shop. Cleaning and waxing a floor after a water damage event puts the final touches on a mitigation/restoration project. It is doing the details that makes a job "Like it never even happened." Working with the Red Cross. Forest fires in the foothills often cause families to be displaced. SERVPRO of Stockton customer service representative (volunteer) taking a "timeout" with a Red Cross administrator/supervisor at a shelter center. 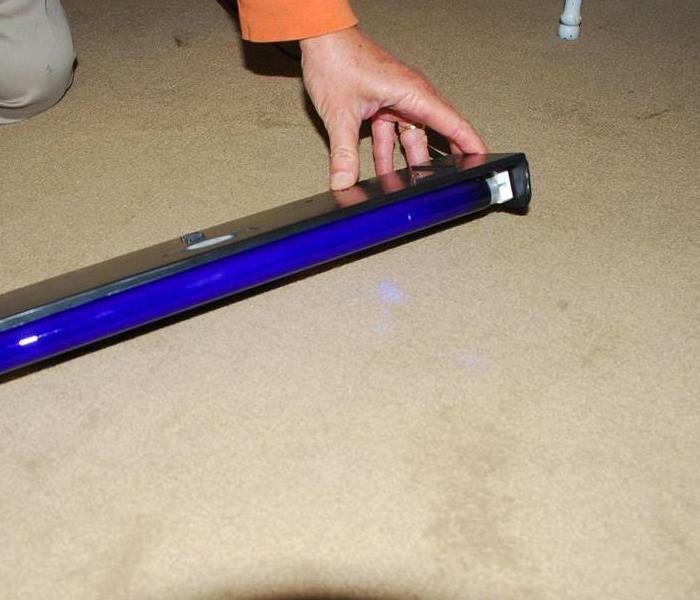 Using a black light to detect the location of urine damage to a carpet at an apartment building. This beats the heck out of the old fashioned method of finding urine...by touch. Hard working carpet cleaning technician improving the appearance of an outdoor carpet. 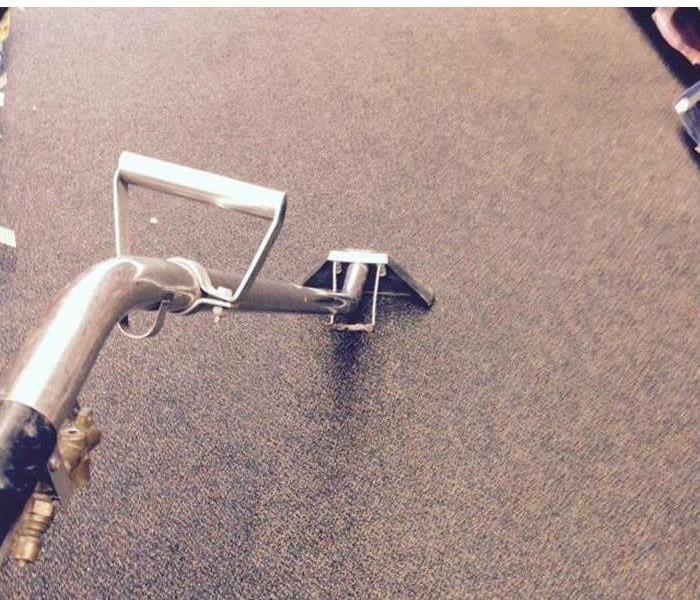 There are several types of carpet cleaning provided by our company. This is the power of truck mounted hot water extraction. 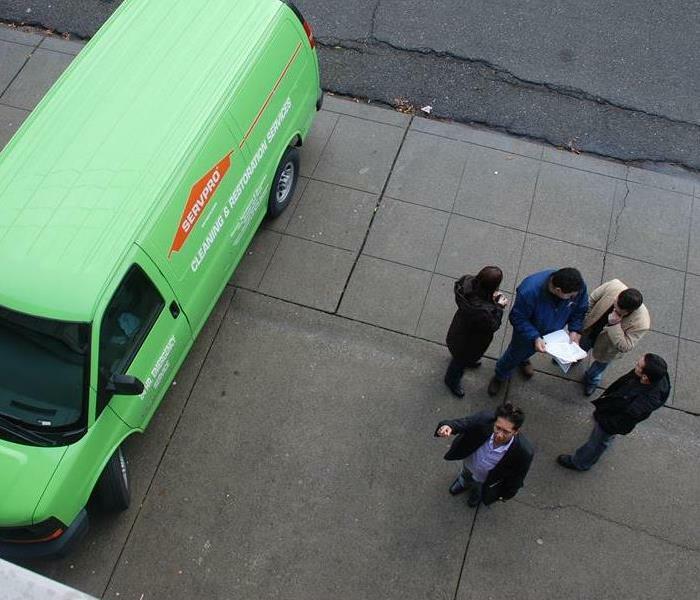 Pictured is the SERVPRO of Stockton food drive in action. A few times each year we use our "little green trucks" to collect hundreds of pounds of boxed foods for the Greater Stockton Food Bank. When smoke contaminates a home, the furnishings and contents must be cleaned. Often, they need to be removed from the dwelling for cleaning and storage, then returned. 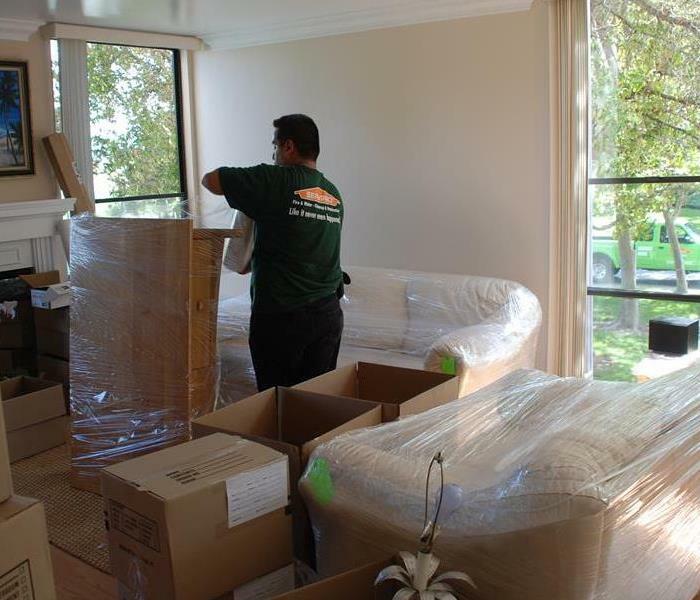 This photo shows our technician returning and setting furniture and decorations in place in a freshly restored home. 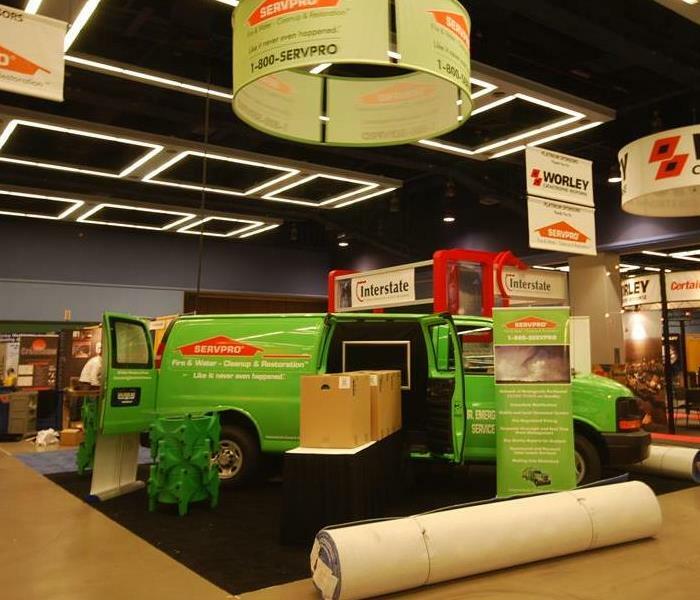 After a water or fire damage has happened, SERVPRO of Stockton is able to provide new floor and carpet installation in addition to all other repairs. We provide expert carpet installation. 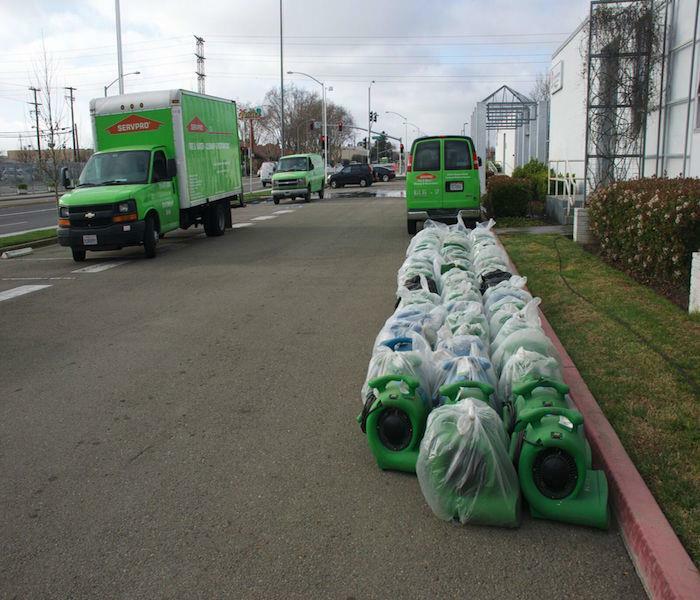 SERVPRO of Stockton is ready for any size job from small to large... sewage backup...commercial fire, or storm flooding. Fifty-three foot trailers are used to bring drying equipment, cleaning agents, hand tools and other items to large job sites. 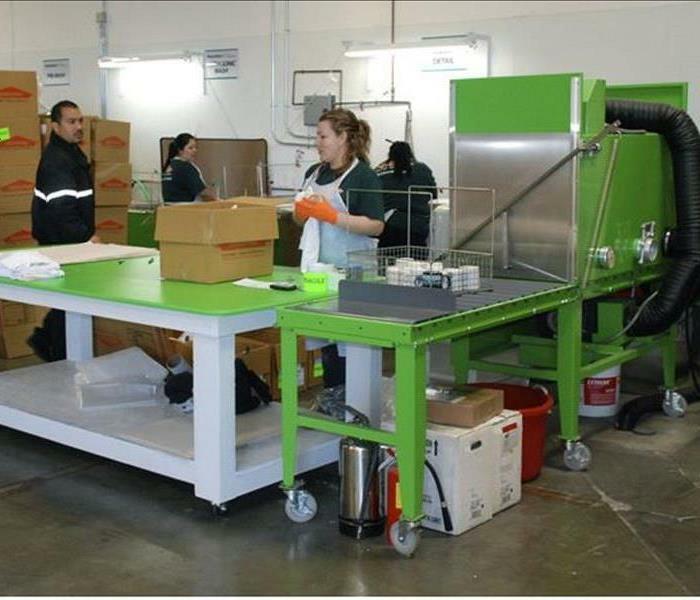 Our SERVPRO of Stockton team provides content cleaning on location and at our warehouse / cleaning facility. Note the inventory forms on the table used to track the contents. 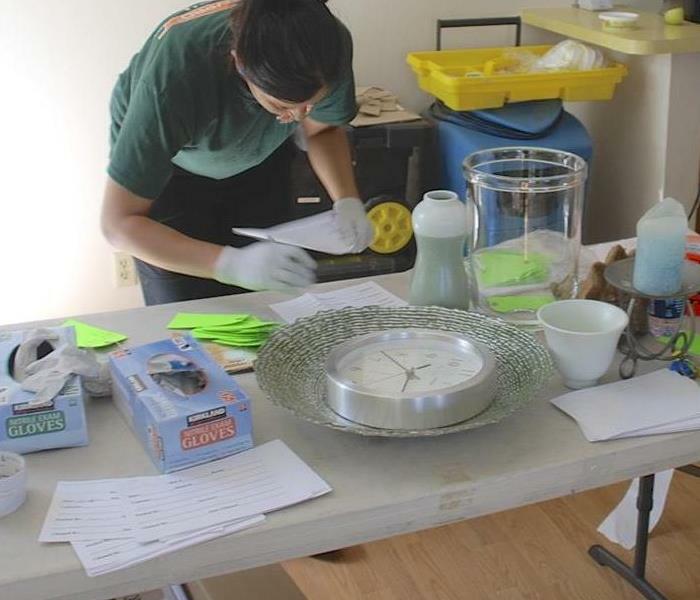 This is how we keep track of your belongings during the cleaning process. Ready to travel to a Colorado forest fire location to help the community. A variety of types of vehicles are used to respond to a storm damage, including RV's and motor homes to provide temporary accommodations. 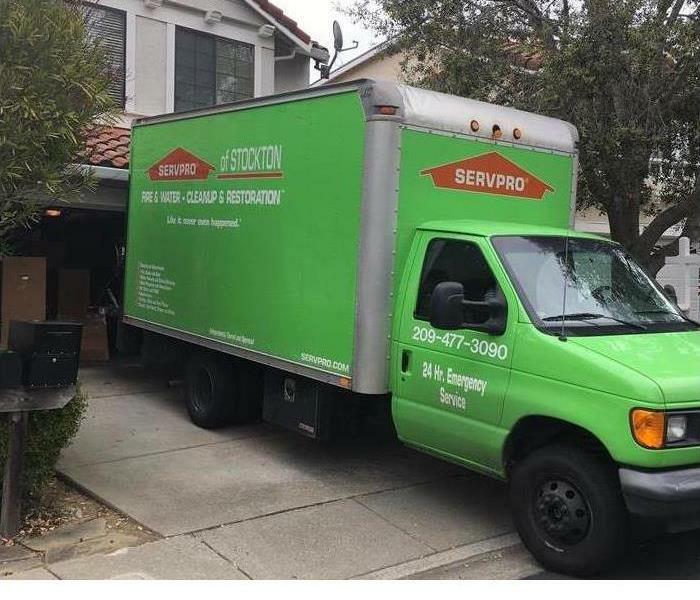 One of our SERVPRO of Stockton box trucks parked and ready for our team to perform a content pack-out so this home can be effectively dried and return to the way it was before the damage happened. Drying wet documents in Stockton. 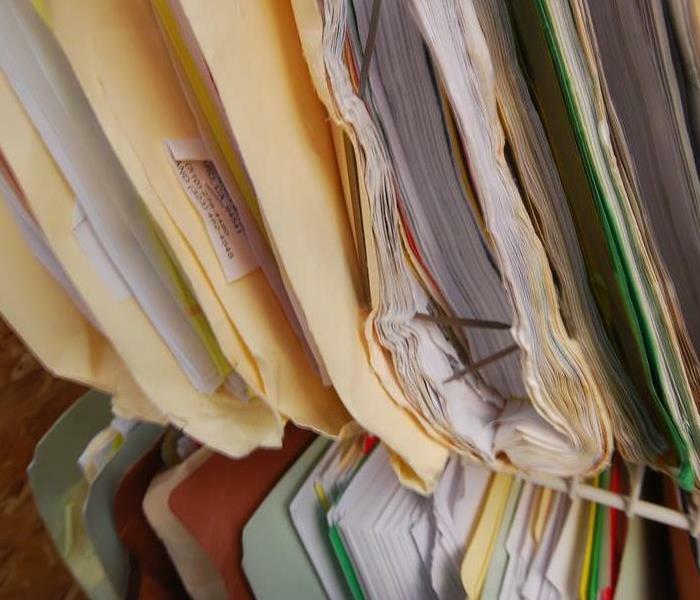 Businesses using maintain boxes of important files and records and if they get wet we can dry them. This picture was taken inside our special drying chamber in our SERVPRO of Stockton storage facility. Call us at: 209-477-3090 for your mitigation and restoration needs. 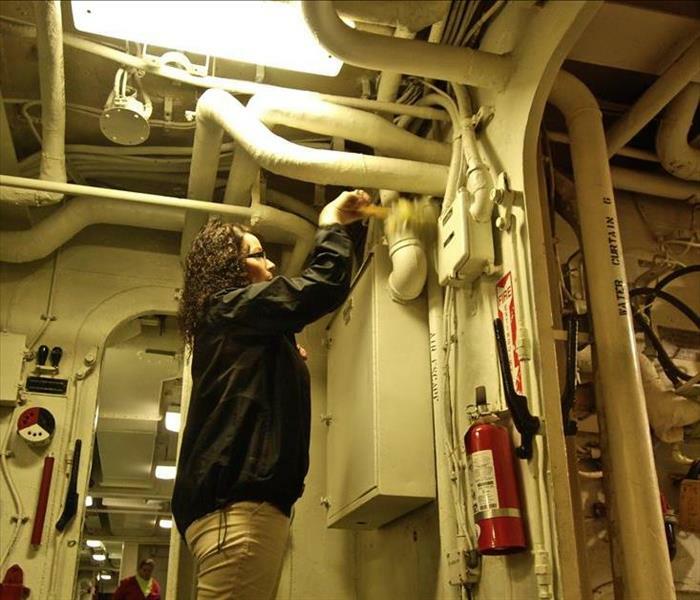 SERVPRO of Stockton, in association with our sister franchises of SERVPRO of Belmont / San Carlos and SERVPRO of San Leandro has participated in the Volunteer Cleaning Day at the USS Hornet Museum aircraft carrier located on the San Francisco Bay. 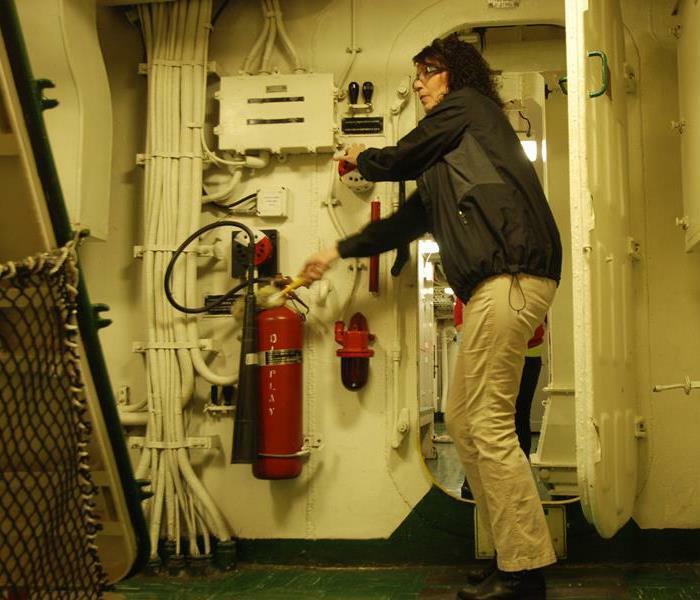 Our SERVPRO of Stockton Branch Manager, Tammy Jensen is seen in this photo performing dusting. Our other volunteer crew members performed pressure washing and other dusting services to help clean and restore this historical treasure. 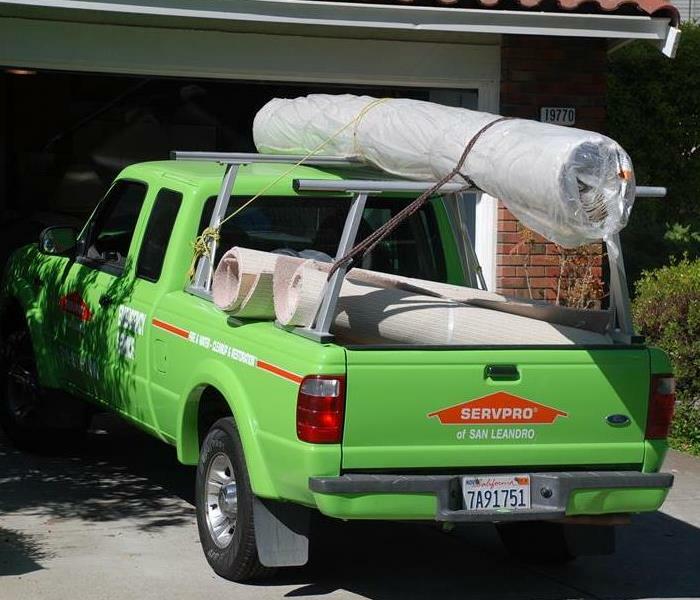 SERVPRO of Stockton also performs community service work in the Stockton vicinity. We participate in local food drives, blood drives and the support of children's programs. and the Red Cross. We believe that contributing to the community is important. 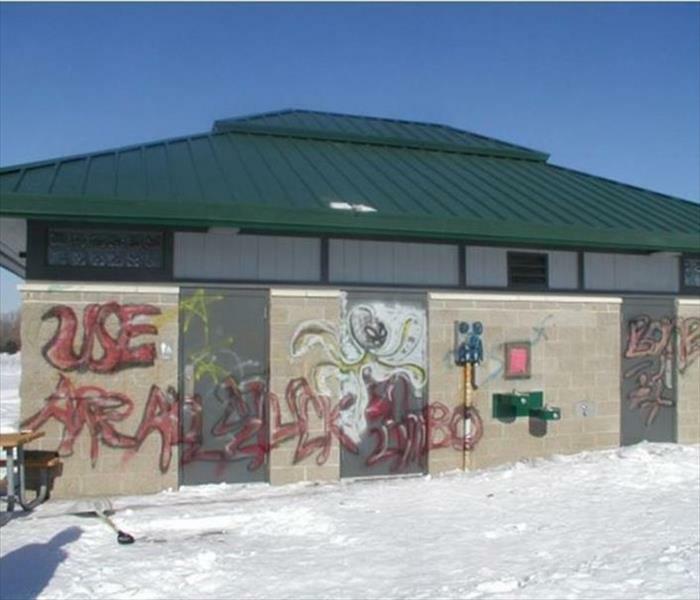 SERVPRO of Stockton can clean graffiti damage sustained to your commercial or personal property. As we all know graffiti taggers are rampant. They can turn something that was once beautiful into something unattractive. 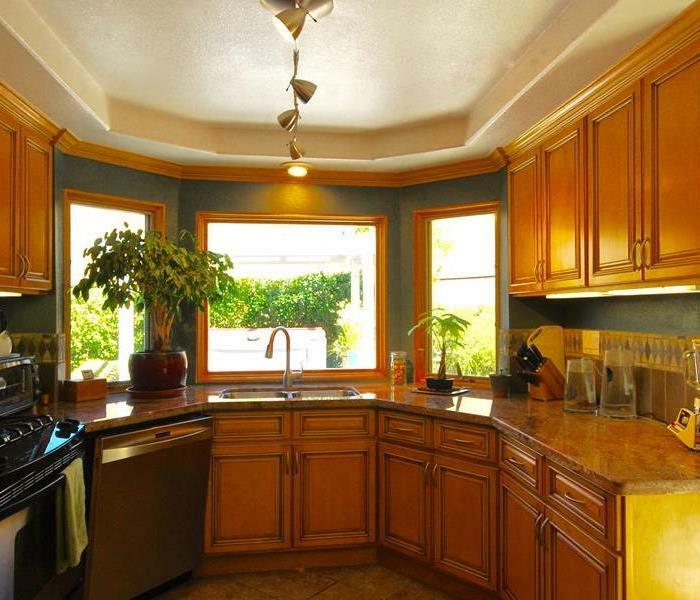 Let the highly trained professionals at SERVPRO of Stockton turn that eye sore into pre-damaged condition. We perform more than just water, fire, mold and sewage damage. We are a full service restoration company. We are here to restore your property "Like it never even happened." Call us today for a competitive estimate. 209-477-3090 We are here to HELP! Cleaning contents with soot and bacteria contamination is not an easy process. So many detailed items such as ornaments, dishes, pottery, picture frames and others household items contain so many little places for soot and debris to collect. Cleaning these items by hand is possible, but a top quality ultrasonic cleaning machine can improve the quality of the results! 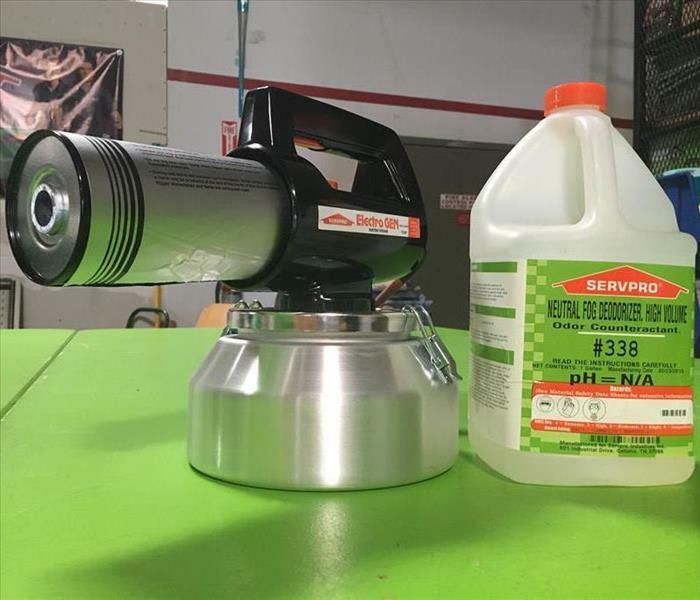 That's why SERVPRO of Stockton invested in an ultrasonic machine to speed and improve the cleaning process for people's valuable contents that get contaminated in sewage backups or via smoke and soot damage. 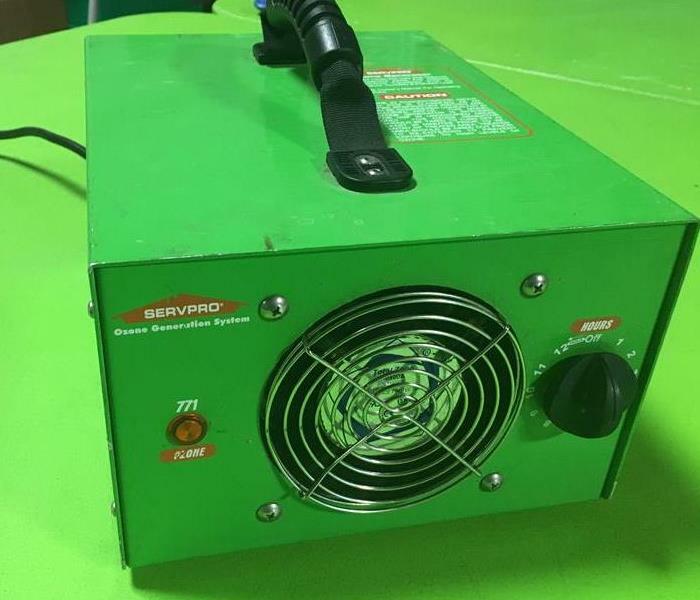 Our SERVPRO of Stockton ultrasonic machine is a portable version that can be transported to a large home, or office location for cleaning on-site or used at our headquarters. High-tech equipment is available to professional cleaning companies who are serious about doing the job right. SERVPRO of Stockton is a leader in fire and water cleanup as well as restoration services in the Stockton and Oakdale areas. Storm damage in Stockton can sometimes take on massive proportions. Significant losses require sufficient equipment and the experienced personnel to carry out large-scale storm damage restoration. 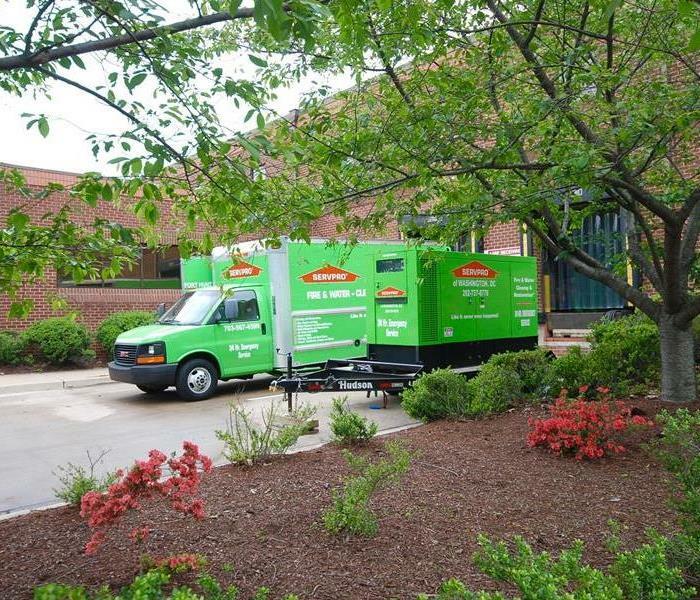 SERVPRO has been an industry leader and their franchises have sufficient equipment to service any disaster. If you are ever in need of storm damage repair of any magnitude, call SERVPRO of Stockton 24/7 at (209) 477-3090. 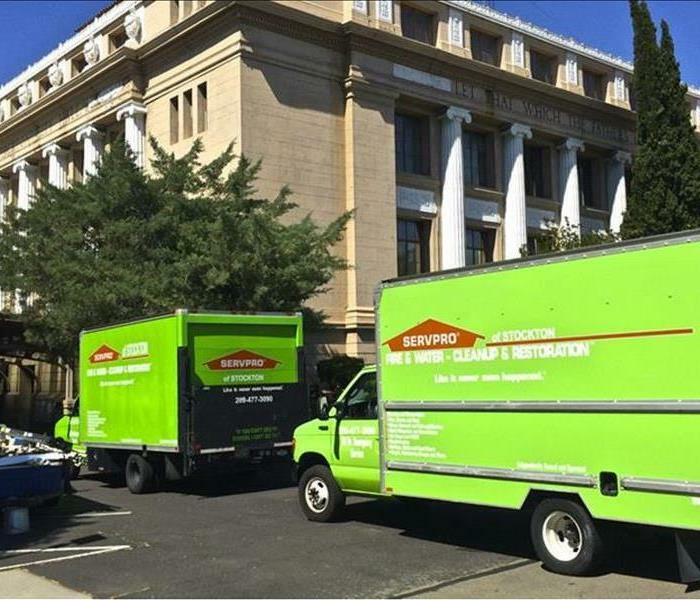 SERVPRO of Stockton was pleased to be able to provided water mitigation services at the Stockton City Hall. 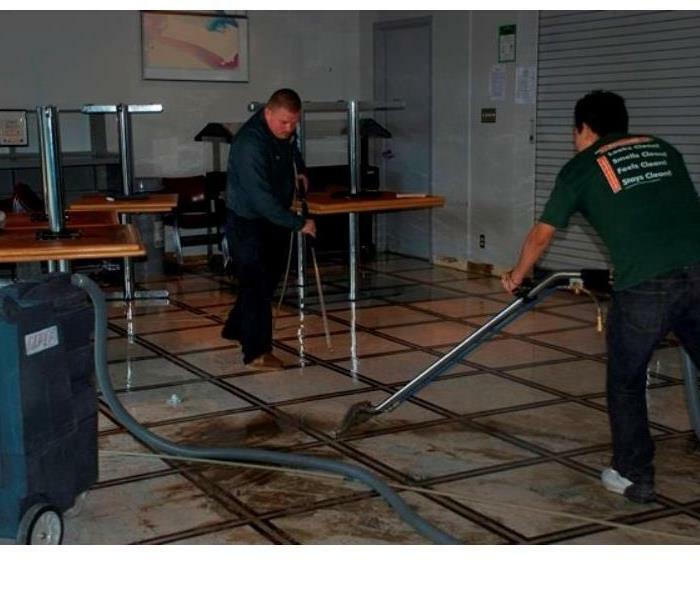 When a plumbing system backup flooded several rooms at City Hall our technicians responded quickly to extract the standing water and move file boxes and furniture away from the wet areas in the stately building. 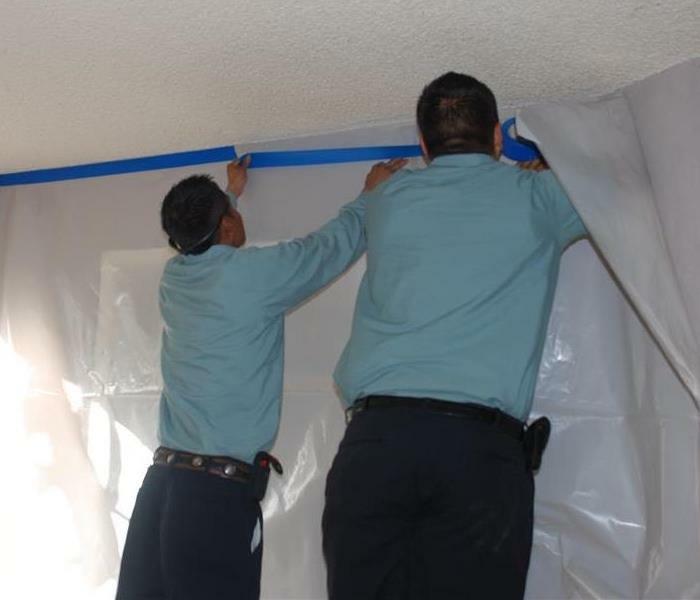 By working closely with the city's maintenance department we were able to dry up and mitigate the damage before mold and bacteria became an issue. Our team of Stockton based managers and technicians always feel a special measure of pride when they can serve their community and successfully fulfill what our slogan says, “Like it never even happened."